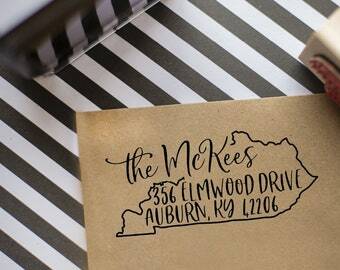 Include the name and address exactly as you'd like it to appear on your stamp. 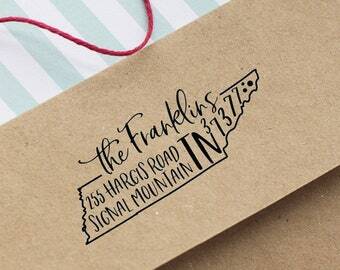 Beautify your mail with this lovely return address stamp. 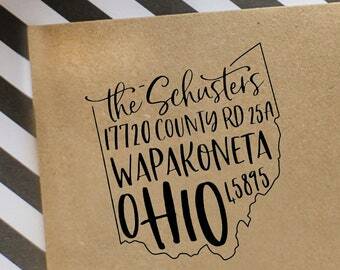 Your name and address will be designed to fit with the outline of Michigan! 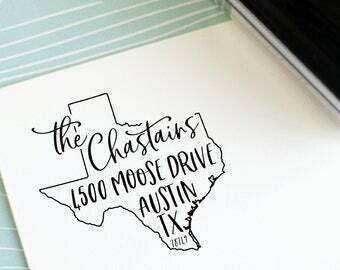 It makes a great bridal shower gift, wedding gift, or a housewarming gift for friends who have just moved or even new neighbors! 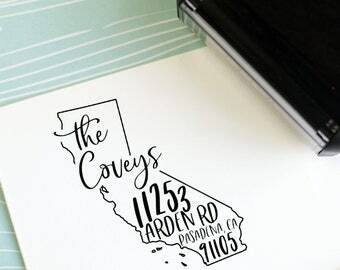 The size of this stamp is approximately 1.5" x 1.5" inches. 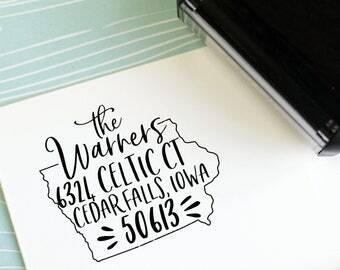 Due to the nature of different characters used in your address and names, actual lengths and heights of the stamp impression will vary slightly. Need a different size? No problem! Please convo me with details. 1. 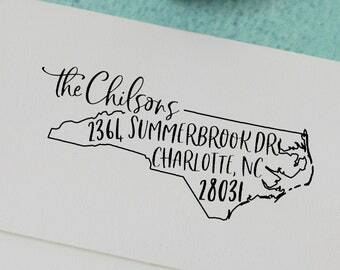 Choose the “Type of Stamp” you’d like and add this listing to your cart. 2. When you check out, leave the verbiage in the “notes to seller" EXACTLY as you’d like it to appear on your stamp. 3. Verify that your shipping address is correct. Your order will be shipped to the shipping address provided on your order. 4. A proof will be sent via conversation on your Etsy account. Please be sure to check for the message with your proof so that your order is not delayed. If I do not receive proof approval within 10 days, I will design and cut the stamp as shown in the proof. ▶ Proofs will be sent via etsy conversation within 24 hours. Turn around time for production will not begin until your proof is approved. If a proof has not been approved after 10 days I will design and cut your stamp as shown in the proof. ▶ Stamp creation will take 1 – 2 weeks. ▶ Self Inking stamps are pre-inked, and are available in black, red, green, blue and purple. Premium colors are available for additional charge. ▶ Ink Pads may be added at check out. Please note that orders with gift messages or gift wrap cannot be rushed. My stamps do leave clean impressions, but the images shown are a graphic, not an actual stamp impression. It is natural for stamp impressions to look “stamped” and not like a printed design. Once a proof is sent, there will be a $10 fee taken from any cancelation. © Copyright Less Ordinary Designs, Inc.
Our family totally loves our stamp! 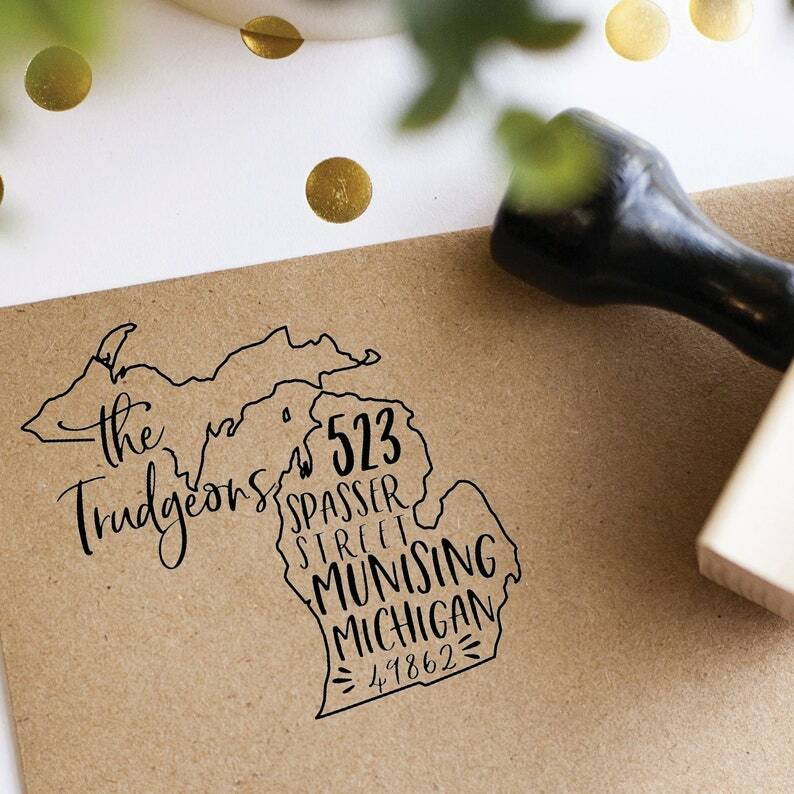 We recently moved to Michigan from out of state, so it is really special to have our return address be unique with the state. Gorgeous work/ amazing seller!